Marc Marquez (Repsol Honda Team) obliterated the opposition on Sunday at the Gran Premio Motul de la República Argentina to take victory by over nine seconds, the reigning World Champion beating second place Valentino Rossi (Monster Energy Yamaha MotoGP) and third place Andrea Dovizioso (Mission Winnow Ducati) as the Italian duo battled it out for the entire race. Marquez got an unthreatened holeshot after a blinder of a start with second place Maverick Viñales (Monster Energy Yamaha MotoGP) getting bogged down, allowing Dovizioso, Rossi and Jack Miller (Pramac Racing) to get by the Spaniard. With Marquez holding position off the line, it was a case of head and hammer down for the number 93 as he bolted to a one second lead on Lap 1, with that gap increasing to 2.4 after Lap 2 as it soon became a race for second. That race for second was fierce though as Dovizioso, Rossi, Miller, Cal Crutchlow (LCR Honda Castrol) and Franco Morbidelli (Petronas Yamaha SRT) scrapped it out. 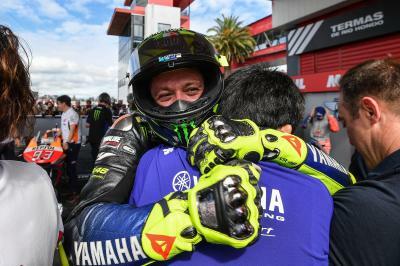 But it was soon rostrum challenge over the Crutchlow as Race Direction gave him a ride through penalty for jumping the start – no repeat win or podium for last season’s Argentina GP victor. Back at the front and on Lap 8 Marquez’ lead was stretched to five seconds as six riders all had their sights set on second, with Danilo Petrucci (Mission Winnow Ducati) and Viñales joining the fray. Rossi eventually got the better of Dovi on Lap 9 after running in hot at Turn 5 on Lap 8 after overtaking his compatriot, but the Ducati rider locked himself onto Rossi’s M1 tailpipes as the Italians locked horns in Termas. It was ‘The Doctor’ who held the P2 baton at the halfway point, eight seconds from Marquez, with Dovizioso, Morbidelli, Petrucci, Miller and Viñales in tandem, with Team Suzuki Ecstar’s Alex Rins creeping up to the rear of Viñales after making up ground from P16 on the grid, firmly tagging himself onto the back of the podium hunt with 10 to go. Viñales then ran wide at Turn 5 as he dropped behind 8th place Takaaki Nakagami (LCR Honda Idemitsu). With nine to go, a Noah’s Ark formation appeared as second to seventh were two-by-two, roughly half a second between the pairings. 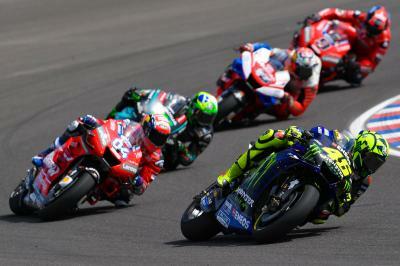 Dovi and Rossi locked together, Morbidelli and Petrucci interchanging for fourth with Rins and Miller engaged in battle. Morbidelli soon found himself down in seventh though, Rins and Miller getting the better of him. Meanwhile, Marquez’ gap had opened up to 12 seconds. The group had closed back up again but with five laps remaining, Dovi and Rossi were edging out an advantage over the chasing pack, with Petrucci, Rins and Miller squabbling for fourth place. Both Rins and Miller getting the better of Petrucci at Turn 5 with three to go. Heading into the last lap it was Dovi leading Rossi. Both were clear of fourth, but which step of the podium would they be standing on? Dovizioso was able to keep second as the Yamaha had no match for the Ducati grunt down the straight, but ‘The Doctor’ sliced his way through on his countryman at Turn 7. A long way up the road, Marquez cruised round to take his first win of the season in scintillating fashion. A Marquez masterclass in Termas, with Rossi earning his first podium since the 2018 German GP. 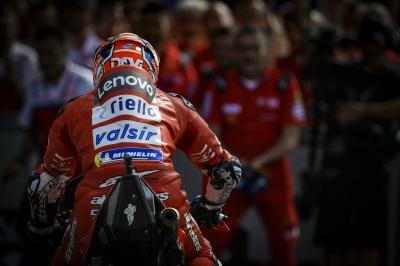 Dovi came home third, achieving his pre-race aims of a podium finish to head to Austin four points behind Marquez in the Championship. Just behind, there was drama for two Yamahas on the last lap. Morbidelli tagging the back of Viñales at Turn 7, the duo going down and out of contention. 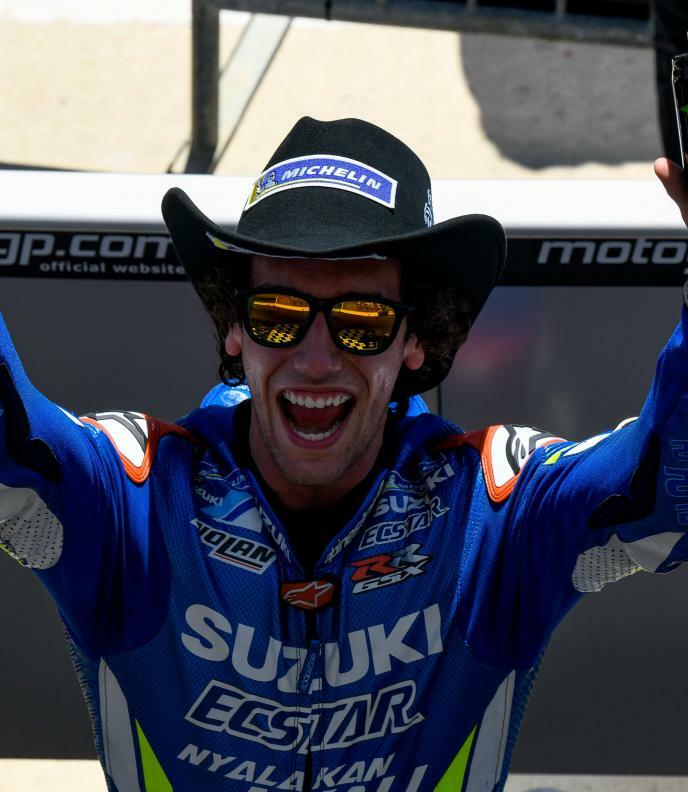 This left Miller holding fourth to repeat his 2018 Argentina GP result, with Rins climbing 11 positions from his P16 starting slot to earn fifth place. Petrucci takes away a second consecutive sixth of the season. 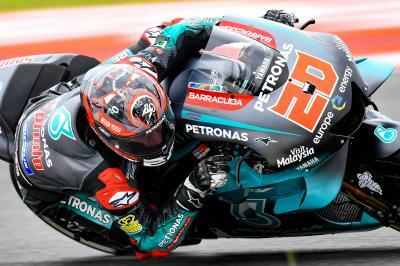 Nakagami makes it two top tens in two in 2019 to come home seventh, with first of the rookies Fabio Quartararo (Petronas Yamaha SRT) picking up his first points of the year with a solid P8. The Espargaro brothers completed the top ten, Aprilia Racing Team Gresini’s Aleix heading Red Bull KTM Factory Racing’s Pol by 0.3. 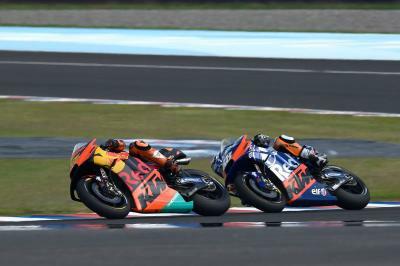 Miguel Oliveira (Red Bull KTM Tech 3) produced an incredibly impressive ride on his second premier class start to finish just 0.176 behind the factory KTM. 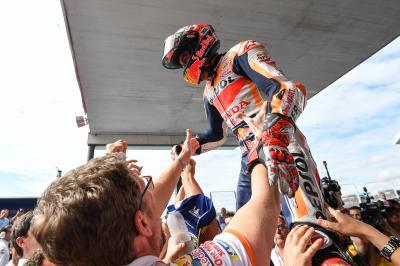 Jorge Lorenzo (Repsol Honda Team), a recovering Crutchlow, Francesco Bagnaia (Pramac Racing) and Johann Zarco (Red Bull KTM Factory Racing) completed the points in Argentina. Karel Abraham (Reale Avintia Racing) and teammate Tito Rabat crashed out - riders ok, with Joan Mir (Team Suzuki Ecstar) retiring in the latter stages. An inch-perfect ride from Marquez sees him head to a happy hunting ground in the form of COTA with a four-point Championship lead over Dovizioso. What will we see at the Americas GP?